1. Safer: the Dallast Mining Series of hydraulic cylinder adopts a brilliant structural design and uses new material in its production, which enables it to work stable in the worst working conditions and thus ensures the safety of drivers and greates benefits for its customers. 2. Faster dumping speed: the use of brilliant structural design improves the dumping speed of the hydraulic cylinder! 3. 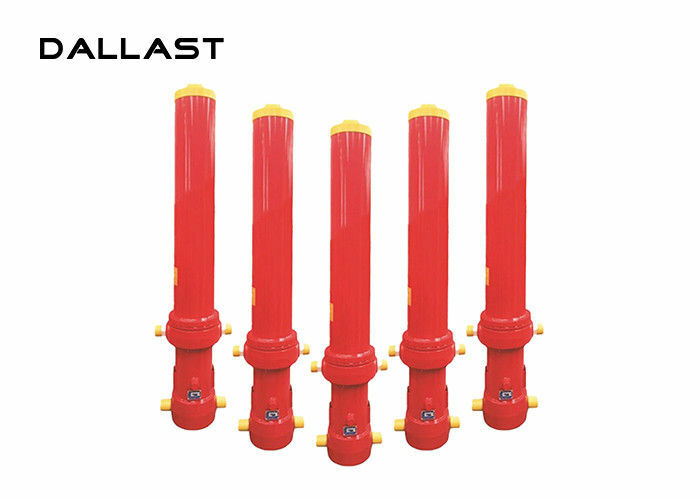 Higher lifting frequency: the Dallast mining series can be used for 24-hour short distance high-frequency work. With its stable performance, low mechanic failure, it can reduce parking time and improve working efficiency. 4. Greater environment adaptability: it adopts newly-developed seal patented technology and new material, and thus can work within a temperature range of -40°C-110°C. it can work smoothly in both high and low temperature environment. 5. Lighter: it is 15%-20% lighter than other series of cylinder, but has improved its lifting force by 10%-15%..
6. Greater lifting power: it has improved its lifting force by 10%-15% when compared with other series of cylinder, which will bring the customers with more benefit. Delivery time 30-40 days after receipt of deposit. Custom Hydraulic Cylinders used in a variety of applications. 2. Construction Machinery cylinders for: loaders, excavator, forklift, bulldozer, dumper, roller, crane etc. 3. Metallurgical Machinery cylinders for: decelerator, tile press etc. 4. Mining Machinery cylinders for: crasher, coal cutter etc. 5. Agricultural & forestry machinery cylinders for: soil preparation machine, harvester, weeded etc.